1. Heat a small frying pan, add the bacon and dry fry for 4-5 minutes until crisp. Transfer to a plate. Put the fish in the pan, scatter the shallots on top and spoon over 3 tbsp of the milk. Cover with a lid and cook gently for 5 minutes or until the fish is cooked through. 2. Put the peas, mint, remaining milk and seasoning in a separate pan and cook for 4-5 minutes until the peas are tender. Blend to a smooth purée with the crème fraîche. Spoon onto serving plates, top with the fish and bacon and serve scattered with extra mint sprigs. 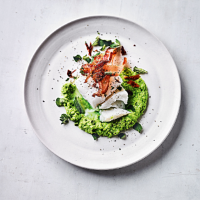 Cook’s tip Try other white fish (eg pollack or haddock) instead of cod. Or use Waitrose Frozen Plaice Fillets, skinned, rolled and secured with a cocktail stick. 1 of your 5 a day. A source of fibre. This recipe was first published in Tue Apr 10 09:38:08 BST 2018.